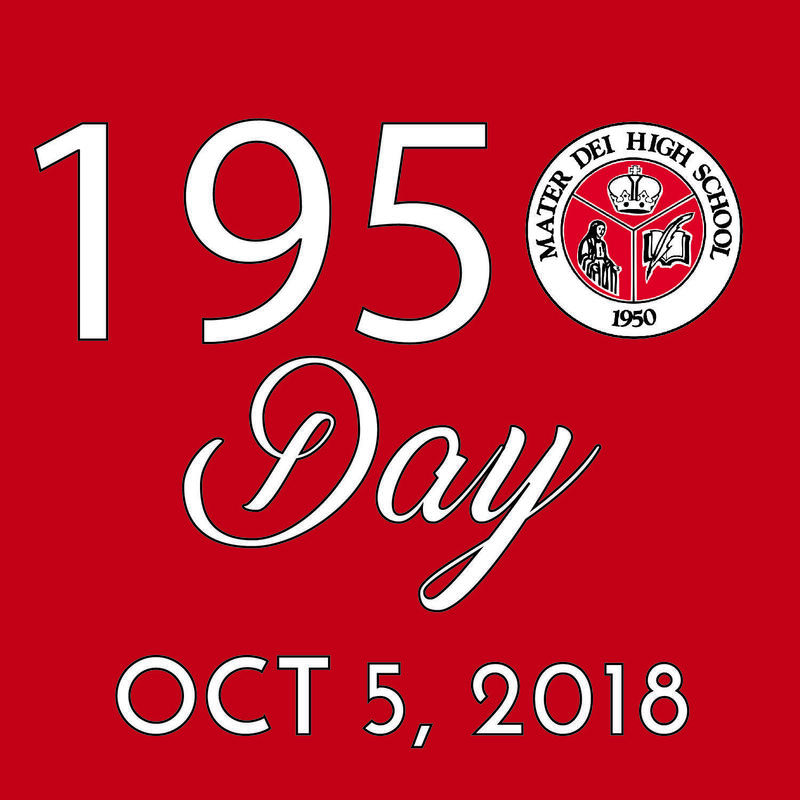 1950 Day is Mater Dei High School's giving day. This is our opportunity to show pride and gratitude for the impact Mater Dei has had on each of us as alumni, current parents, lifetime parents, grandparents and friends of this great high school. All Monarch families are encouraged to band together in the spirit of honor, glory and love and make a gift of any size. Together, we are stronger together and have the opportunity to make a significant impact in just 24 hours. Our inaugural 1950 Day will take place on Friday, October 5, 2018 in conjunction with Homecoming Week. Mater Dei High School opened its doors in 1950. In just under 70 years, we have grown from a local, Catholic, college preparatory high school to a world-renowned destination of excellence in academics, visual and performing arts, campus ministry, student activities, and athletics. HOW CAN I MAKE MY GIFT ON 1950 DAY? On 1950 day (Friday, October 5), you will be able to make your gift online, over the phone, or in person at the Homecoming Game at the Santa Ana Bowl. If your company sponsors a matching gift program, you can easily increase the impact your gift will have on students, faculty and programs at Mater Dei. Most participating companies will match employee gifts dollar for dollar. Some will even double or triple-match a gift! Click here for our search tool for matching gift companies. There is no minimum gift amount for 1950 Day. Gifts of all sizes from all walks of life are encouraged - young alumni, grandparents, current parents, lifetime parents, and friends. Every gift makes a difference - especially yours. All donations to Mater Dei and 1950 day are tax deductible. WHAT OTHER WAYS CAN I HELP 1950 DAY BE A SUCCESS? You can support 1950 Day by spreading the word and encouraging other Monarchs to participate. Through your peer-to-peer outreach, you will be asked to encourage your fellow Monarchs to give by spreading the word through social media, emails, texts and calls. Click here for more information. I ALREADY MADE MY GIFT TO MATER DEI THIS FISCAL YEAR. WILL THAT COUNT FOR 1950 DAY? Thank you for supporting Mater Dei High School. We will officially accept gifts on October 5 to count towards our 1950 Day goals. We hope you will consider making an additional gift of any amount in support of this important initiative. Please contact us at alumni@materdei.org or call 714-850-9534. Stronger Together - Keep it Going!